Yesterday John Glenn, the first American to make an orbital flight, passed away. He was hospitalized more than a week ago but no information about his health problems were provided. However, a source linked to his family revealed that his condition was grave and his relatives joined him in the hospital. On February 20, 1962, John Glenn became the first American to make an orbital flight on the Friendship 7 spacecraft. 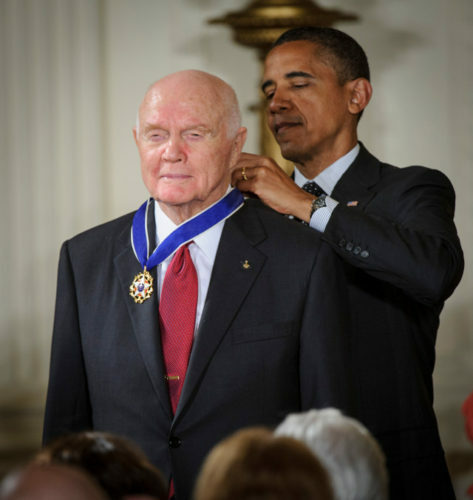 Instantly, he became a national hero and was honored with the NASA Distinguished Service Medal, which he was given directly by the then US President John F. Kennedy. When he was still a senator, John Glenn went into space again as part of the crew of the Space Shuttle Discovery, launched on October 29, 1998 for the STS-95 9-day mission. Glenn established the record as the oldest human being to have traveled in space as at the time he was 77. During and after the mission, he underwent a series of tests for a geriatric study on the reactions of an elderly person to a space mission.